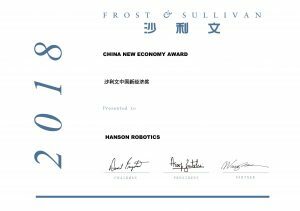 Based on the analysis of the intelligent robots market in China, Frost & Sullivan recognizes Hanson Robotics Limited with the 2018 Frost & Sullivan China New Economy Award. 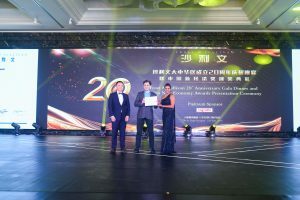 Ms. Rhenu Bhuller – Frost & Sullivan Partner and Mr. Fox Hu – Managing Director of Frost & Sullivan China, presented the award to Dr. David Hanson, CEO and Founder of Hanson Robotics Limited. Hanson Robotics Limited was established by David Hanson in 2014 in Hong Kong. The company creates human-like robots endowed with remarkable expressiveness, aesthetics, interactivity, and advanced artificial intelligence (AI) technology. The company aims to bring robots to life: as engaging characters, as useful products, and as true living AI, for ever-greater good.The life-like appearance and behavior of the company’s robots spring from a unique combination of cutting-edge innovations in materials, hardware, software, and AI, all brought together under the arts of animation and storytelling. Their advanced AI ingests emotional, conversational, and visual data that inform uniquely rich insights into how people think and feel. Dr. David Hanson, CEO and Founder of Hanson Robotics Limited, brings a strong history of innovation and leadership in arts, academia, science, engineering, and entrepreneurship in AI and robotics. In the past decade, he has built a worldwide reputation for creating the world’s most humanlike, empathetic robots which received massive media and public acclaim. Dr. Hanson has earned numerous awards including from NASA and Tech Titans’ Innovator of the Year. His quest is to realize Genius Machines—machines with greater than human intelligence, creativity, wisdom, and compassion. At Walt Disney Imagineering, Dr. Hanson worked as both a sculptor and a technical consultant. Dr. Hanson received his BFA from Rhode Island School of Design in film/animation/video, and his Ph.D. from the University of Texas at Dallas in interactive arts and engineering. In 2015, Sophia, the company’s latest robot, was unveiled at SXSW in Austin, Texas. The world quickly fell in love with her as she was invited to be a speaker at the United Nations General Assembly, NATO, and numerous conferences, and was appointed as the first Innovation Champion for United Nations Development Program (UNDP) in Asia Pacific. In late 2017, she became the first robot in history to receive citizenship. 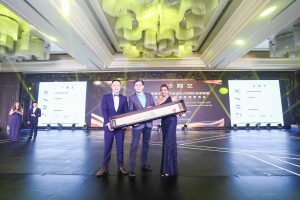 Sophia is a celebrated media personality but is first and foremost a research platform for Hanson Robotics’ ongoing AI and robotics research work. Sophia is the inspiration for a line of social robots that will radically disrupt the media and service robotics market with high-quality expressions and rich verbal and nonverbal interactivity, enabling them to build effective and trusted relationships with people. These robots have immediate opportunities in proven humanoid markets including university research, medical training, and entertainment animatronics in museums and theme parks. In addition, there are significant market opportunities for Sophia and other Hanson character robots in media markets, including movies, TV shows, brand campaigns, and live events; healthcare applications such elderly care, depression therapy, autism therapy; home tutoring and education; as well as sales and customer service. 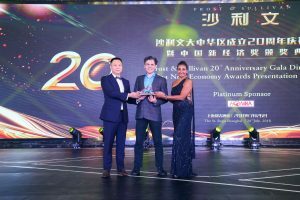 The 2018 Frost & Sullivan China New Economy Award – aimed at assessing outstanding enterprises in terms of growth, innovation, leadership, customer service, corporate finance and investment – was established to recognize and appreciate the great and endless endeavors of it’s award winners. Hanson Robotics was broadly recognized by its remarkable innovative technology, abundant product portfolio, and outstanding brand awareness. Frost & Sullivan strictly reviewed and conferred the 2018 New Economy Award to Hanson Robotics after evaluating aspects of corporate technology, personnel, capital, information and other essential elements.